I enjoy a good movie but it seems that I never take the time to actually watch them. I even opened a Netflix account thinking that would help me out. The reality is that I select movies, they arrive and then they sit around for a few weeks until I make myself sit down and watch them. This past weekend I finally got around to watching a movie that's been on my list (and on my counter) to see for quite some time. Once, released back in 2007 (though it's only been on my counter since mid-March), is a Romeo and Juliet style romance about two star-crossed musicians. I love, love, love the soundtrack and bought it when it first came out. 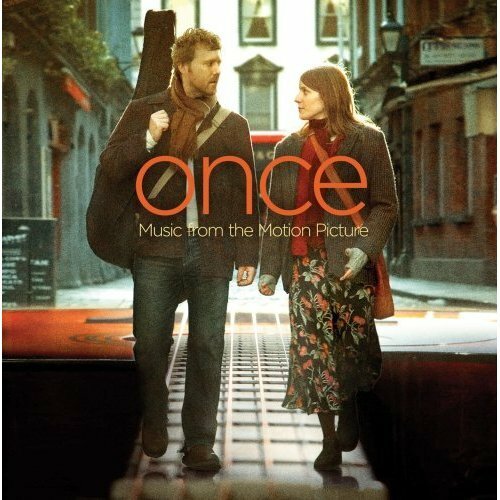 I was thrilled when "Falling Slowly" was nominated and won the 2007 Academy Award for Best Original Song and the soundtrack went on to be nominated for a Grammy. Glen Hansard and Markéta Irglová, who tour together as The Swell Season, truly make beautiful music together. I have a soft spot for Indie films and with such a brilliant soundtrack, I knew I'd love the movie. Yeah... well, not so much. After seeing the film I read some reviews about it. I felt badly for not liking it to begin with but after reading that this the film made all sorts of "Top Movie" lists, I really felt badly. Steven Spielberg was even quoted as saying "A little movie called Once gave me enough inspiration to last the rest of the year". Oh well. In full disclosure, I didn't dislike the movie, I just didn't like it. I watch movies to be entertained, inspired or just downright escape. This movie didn't do any of those things for me. The soundtrack, however, does all those things and is well worth a listen. I'm sharing "Falling Slowly" with you here today but I would have been happy sharing any of the songs from this album. What do you think? Have you seen the movie? Thumbs up or down? What about the music? Are there any other soundtracks that are on your Must Listen To list? Hmmm interesting. This movie has been in my Netflix queue forever. I'm not sure you've convinced me to watch it at all now. Lol. I kind of miss the days of video stores. When we actualy had to drive down to the store and pick one out, watching the movie was a special and treasured event. Now that we've got practically every movie we've ever wanted either online or delivered to our door with no late fees, it becomes almost hard to find time to enjoy them anymore. It's like by having easier access to movies, we've actually started taking them for granted! Never heard of the movie but I don't think I will be putting it in my netflix list! I've learned to pay attention to the people's reviews. I've seen some strange but funny movies lately - like a cute little one entitled Assassin in Love and then one with Cher (Faithful) which had me smiling a lot after the movie was over and thinking, "What a great movie!"